Everything Tokidoki makes seems to be adorable. They always have the cutest little characters and drawings all over their packaging. Until I tried Latte, though, I knew nothing about the quality itself. Latte is really complex for a big brand glitter. 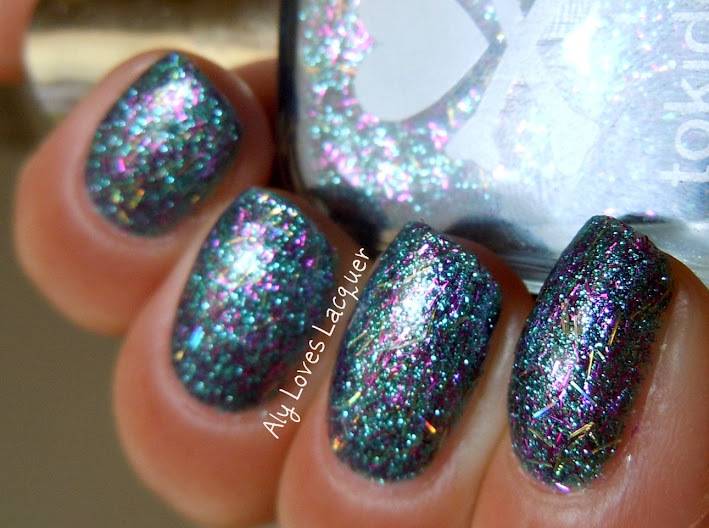 It has lots of tiny blue microglitter, as well as magenta bars and gold holographic ones too. I am happy to report that Latte was awesome! It had great glitter payoff and I had perfect opacity after 3 thin coats. It wasn't too hungry either -- just 1 coat of Seche Vite and I was good to go! So there you have it! At the moment, this color is sold out on Sephora. But! They have a couple other Tokidoki glitter polishes in stock. I suggest you take a look, because I really love this one and they are only $6.00! PSA: Orly on Hautelook Today!